Awesome, right? Sometimes you have to go over-the-top. 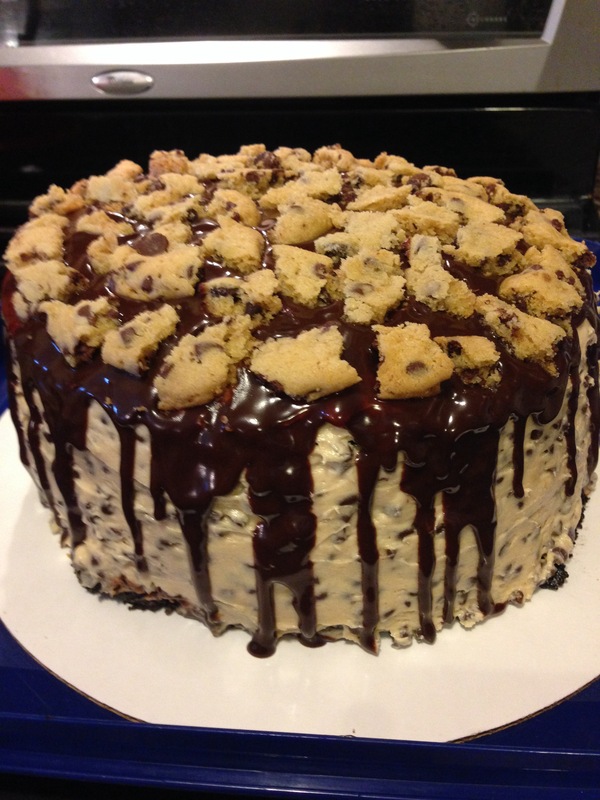 This is a chocolate cake with chocolate-chip cookie dough frosting, topped with a chocolate ganache and pieces of chocolate-chip cookies. The chocolate cake was so soft and fluffy, yet sturdy enough to support all of the frosting, ganache and topping. The chocolate flavor was exactly the richness I wanted. The moisture kept for days after baking. This chocolate cake recipe will definitely be used again and again, and with other frosting combinations! 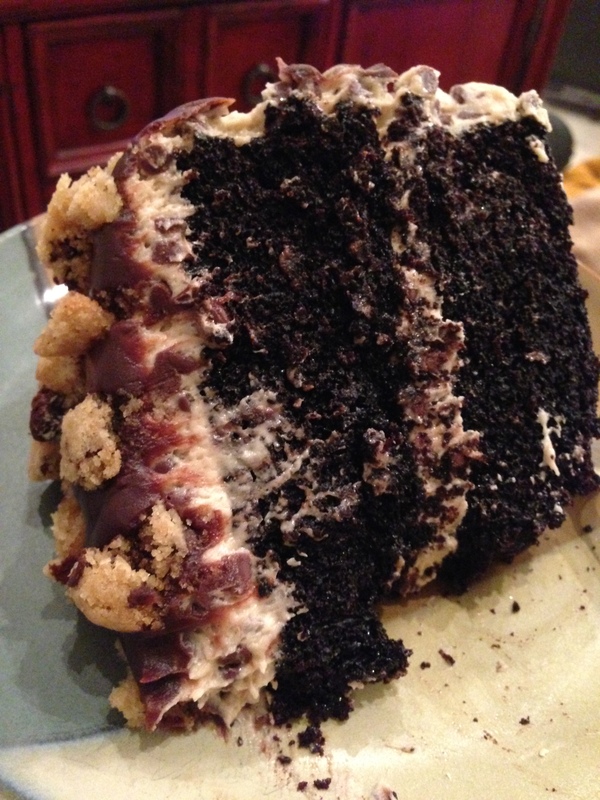 The chocolate-chip cookie dough frosting is really great, too. I mean, chocolate-chip cookie dough frosting! I saw a few recipes that used it to top cupcakes and thought it would be interesting for cake frosting. Using mini chocolate chips makes spreading the frosting easier. I’m still in search of a ganache recipe that I like. This one didn’t harden as much as I expected, but I think that was OK in this case because it ended up melding with the chocolate-chip cookie dough frosting (see the last picture below), making the top of the cake really special. If the ganache was over-the-top, adding the chocolate-chip cookies was just excessive. I had been saving up all these recipes for cookies and brownies, and I felt like this was the perfect way to incorporate one of them. 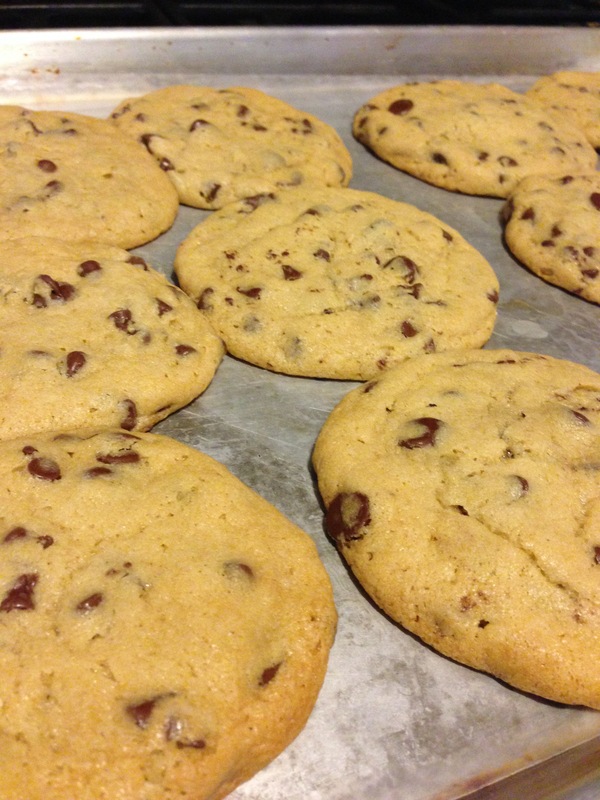 These are probably the best chocolate-chip cookies I’ve ever made. They taste better than bakery-style, and the texture is so soft. I was very pleased with them and will turn to these the next time a simple chocolate-chip cookie solve my seemingly insatiable lust for dessert. This may be one of the best culinary creations I’ve ever baked. Look at that. So good. For the cookies, part I: Whisk together flour, baking soda, cornstarch, and salt in a large bowl and set aside. In a separate, medium bowl, whisk the melted butter, brown sugar, and granulated sugar together until there are no lumps. Add the egg and the egg yolk, followed by the vanilla. Pour the wet ingredients into the dry ingredients, and mix together. Fold in the chocolate chips, then cover and chill for at least two hours or overnight (I did overnight due to timing). Whisk flour, sugar, cocoa powder, baking soda, and salt in a large bowl. Add sour cream and vegetable oil, using a spatula to blend. Gradually beat in the water, 1/2 cup at a time. Blend in vinegar and and vanilla. Divide the batter between the two cake pans. Bake for 45-50 minutes or until cake tester comes out clean. Let cool for 20 minutes, then carefully invert onto a wire rack lined with parchment/wax paper (cakes are very soft and moist). Carefully remove parchment/wax paper from bottoms of cakes. Once completely cooled, tightly wrap cakes in plastic wrap and refrigerate for at least 30 minutes or overnight to firm the cakes before frosting. For the cookies, part II: Preheat oven to 325 degrees (or lower temperature to 350 degrees). Line two baking sheets with parchment paper. Roll the dough into ~3 tbsp. balls (taller rather than wider) and place on the baking sheets, making sure to leave enough room (3″ or so). Bake for 10-15 minutes depending on the size of the cookie dough balls (the cookies will continue to cook after taken out of the oven; the longer in the oven, the harder the cookie). Allow to cool completely, then store. Set aside 3-4 cookies (there will be many more) for the cake topping. For the frosting: Using a stand mixer, cream the butter and sugar at medium speed. Add vanilla and beat well. Stir in flour and salt until doughy, then beat in milk until fluffy. Fold in chocolate chips, then frost the cakes. For the ganache: Heat the heavy cream and chocolate in a small saucepan over low-to-medium heat until smooth. Remove saucepan from heat and allow ganache to come to room temperature. Pour ganache over the top of the cake, and spread it to the edge, allowing it to spillover the sides. For the cookies, part III: Crumble the chocolate-chip cookies that were set aside, and scatter on top of the ganache.